This post is from one of the 16 interns in the Real Time Farms Food Warrior Summer Internship Program (our Fall 2011 Food Warriors have started and will be blogging soon!). These interns collect data, pictures, and video on the growing practices of our nation’s farms, collect food artisans’ stories, and document farmers markets. We all deserve to know where our food comes from! In Southern California “local” dairy generally means milk and cheese from central California – a good 400 – 500 miles from Los Angeles. As a someone who tries to eat sustainably which, in large part, includes foods that travel a minimum amount from field to plate I find the lack of local dairy to be quite limiting. 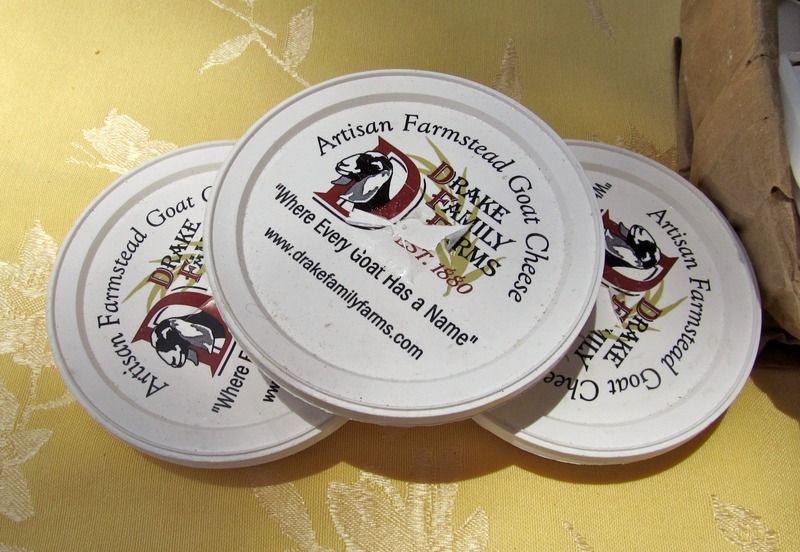 Happily, while visiting the Altadena Urban Farmers Market this spring I came upon a small table sampling Drake Family Farms goat cheese and was surprised to discover that Drake cheese comes fresh from Ontario, California – a mere 40 miles from Los Angeles. I recently had the privilege of visiting Drake Family Farms and learned more about truly local Southern California dairy. As you exit the freeway in Ontario you find it hard to believe that milk and cheese could be just a few miles distant. You are immediately confronted by the sight of fields; not of animals, but of homes. The suburban landscape gives way to a rather odd mix of a feed store interspersed with more new tract homes, a barren field of cattle, and a strip mall of fast food joints. And then suddenly there is a lush green lawn, a grouping of barns, and the sight of goats. Drake Family Farms-Southern California is a newborn in the California farmscape, but has old roots. Dan Drake, a practicing veterinarian grew up on his family’s century old goat farm in Utah. After graduating from UC Davis and opening a veterinary practice in Southern California Dan became increasingly dissatisfied with the lack of good local dairy products in the region and decided to take the plunge of starting his own farm. 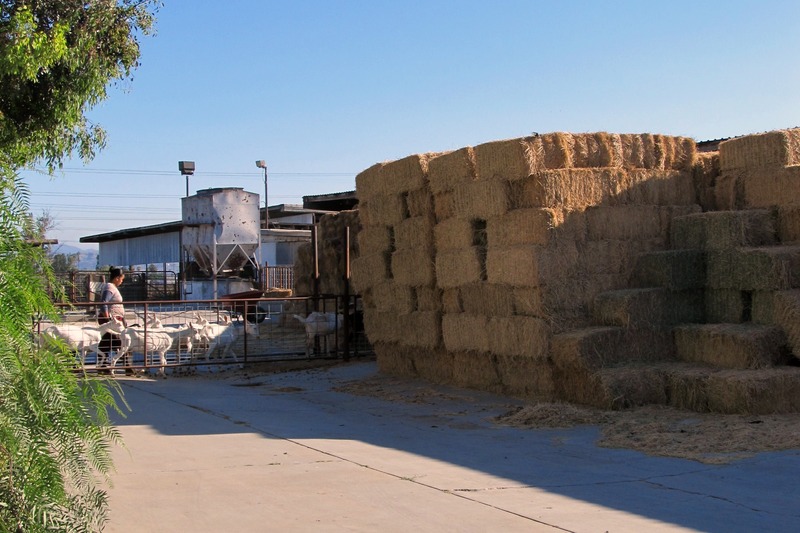 Drake Family Farms began operations on September 19, 2010 with an initial goat herd of 80 animals moved from his family’s Utah farm to Southern California. With additional moves and births the herd is now up to approximately 200 goats. There are room for quite a few more on the 10 acre property although Dan says that he wouldn’t feel comfortable going above about 400 goats given the quality of life that he wants to give them. The farm is populated primarily by adult female milking goats as well as a few adult males,and quite a number of “kids” ranging in age from a few weeks to a few months old. Drake Family Farms milks three breeds of goats, Sonnens and Alpines renowned for their prodigious milk production and Nubians known for their rich milk. And their slogan of “Where Every Goat Has a Name” is more than a cute marketing catchphrase. Every goat actually has a name – imprinted on a metal tag worn on a collar around the neck of each goat – and Dan remembers each and every one of them. Talking to Dan it is apparent that the goats are not a commodity to him but a labor of love. He spoke proudly of how last year the farm had the #3 Sonnen breed leader in the nation who produced an incredible 4,605 pounds of milk in 305 days. When we inquired as to whether we could see her, Dan sadly replied that she had died, along with her three kids, in a complicated birth. But there is a happy ending to this story – the mother of the breed leader is still alive and the farm had the sperm from her father. Thus the late champion goat now has a baby brother and a sister to carry on the line. It is scorching hot out in the inland sun but in the shade of the open-air goat barns, with an afternoon breeze blowing through, it is cool and peaceful. Many of the adults munch contentedly on hay, kids nurse and frolic and with their mothers, and a fair number of goats amble up the sides of their pens at the sight of people – eager for a scratch. Looking at the dairy goats I am reminded far more of the social and playful nature of dogs than of cows. Dan explains that Drake Family Farms is not organic – and never will be. He further elaborates that organic certification forbids the use of antibiotics in milking animals and that he believes it is cruel to deprive an animal of basic care if medically indicated. That said, the farm is, in many ways, what consumers have come to think of as “organic” – the goats are fed a simple diet of primarily hay – free from any added hormones or drugs. For simplicity’s sake the mother goats raise and nurse their kids (in addition to being milked twice per day), as opposed to the kids being separated from their mothers and bottle fed. 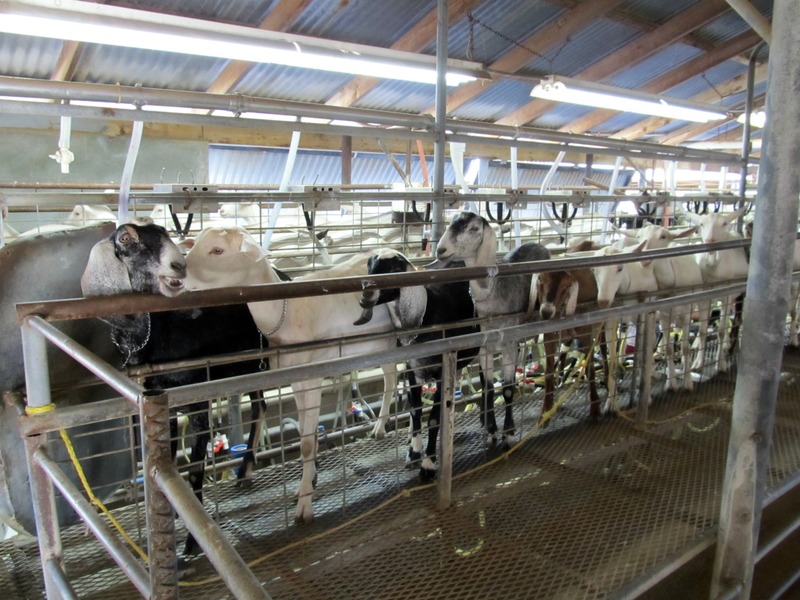 When it is time for milking the goats eagerly line up – seemingly quite comfortable with the process. After the milk is collected the goats flow back into their barns and the milk is immediately cooled to 35 degrees using a plate cooler. The milk is kept cold in a large holding tank. Twice a week cheese is made. Prior to cheese making the milk is heated to 145 degrees for 30 minutes for pasteurization. 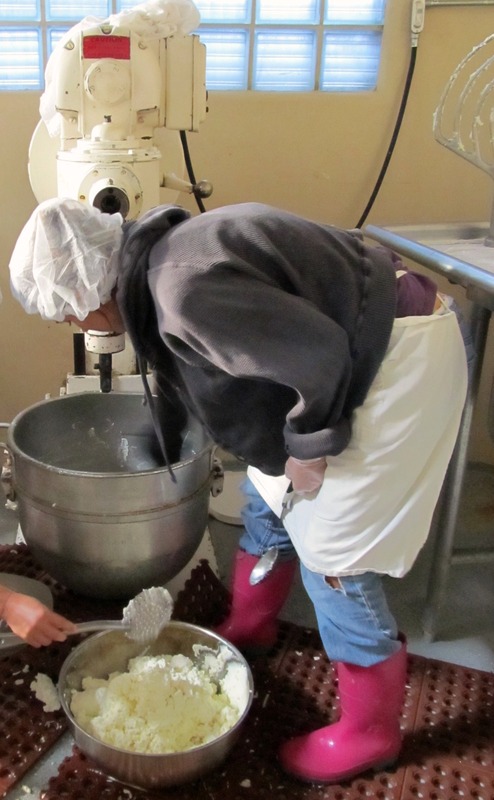 The milk is then immediately cooled to 76 degrees and the cheese making process begins. Cheese cultures are added and the milk is left to culture for 12 hours. The cheese curds are then bagged and left to drain on a special cheese table. The cheese, now fresh chevre, is finally packed as plain chevre or mixed with other ingredients to form one of the farm’s seven signature flavors: lemon pepper, apricot & honey, herbs de Provence, garlic & onion, french herbs, and jalapeno. Drake Family Farms goat cheese is available at select Southern California Whole Foods Markets, the Saturday Santa Monica Farmers Market, as well as in a number of local restaurants. 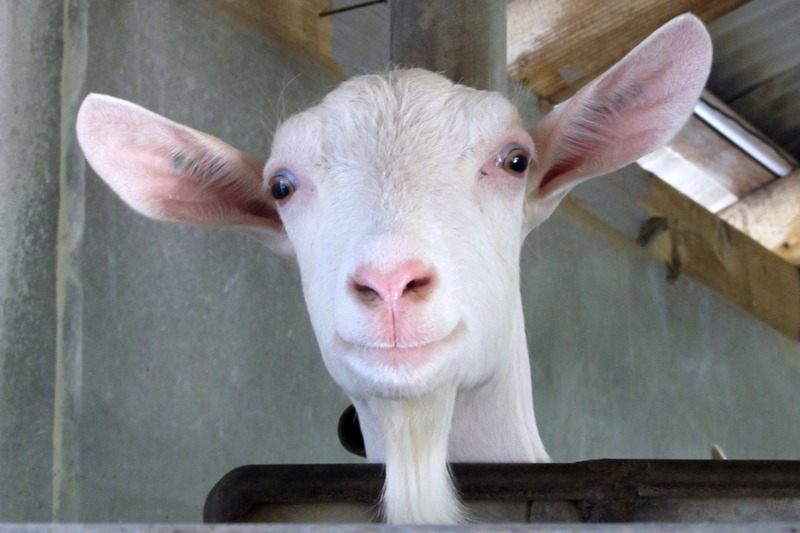 Drake Family Farms goat cheese isn’t cheap – nor should one expect it to be. It is delicious, top quality, local food produced on a small family farm that, unlike industrial agriculture, receives no subsidies. Like any small business Drake struggles with challenges such as the high cost of utilities (it takes a lot of energy to cool and then pasteurize thousands upon thousands of gallons of milk per year) and paying its workers a living wage. As a farm Drake has the additional challenges of unpredictable factors like the weather and marauding coyotes. Dan laments that it is approximately three times more expensive for him to run a goat farm in California versus Utah. But Southern California is Dan’s home and so he perseveres and my taste buds are thrilled that he does. This entry was posted in Food Warrior Interns, On the Farm and tagged cheese, chevre, dairy, drake family farms, food warriors, gina buccolo, goat cheese, goats, Real Time Farms. Bookmark the permalink. You can also find Drake’s cheese on our menu at The Press Restaurant in Claremont, and you can buy the cheese directly at CHEESE CAVE in Claremont. We love it! This is a great article. It is well written and tells a lot about dairy goat farming. Great article Gina! I came across their stand before applying to the Food Warrior program myself! !